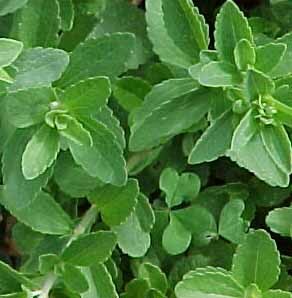 Stevia (rebaudiana). Stevia, a Remarkable herb we are growing at Tilford cottage garden. A friend gave me a small plant and now I have several from the mother plant. Read on! Stevia (rebaudiana) is a plant native to South and Central America that belongs to the sunflower family (Asteraceae). Altogether there are 240 species of the Stevia plant in the world. It has been used as an alternative to sugar by the population of Paraguay and Brazil for about 500 years because the extract of the plant is up to 300 times sweeter than sugar. In other words, you only need one or two leaves of it, to sweeten one cup of strong coffee or tea. What Are the Negative Side Effects of Stevia? There are no really confirmed negative Stevia side effects for humans. However, Stevia is forbidden as a food additive in the European Union and some other countries, because many people say that there are still not enough confirmed studies confirming that Stevia is not harmful in any way. In these studies the dose of Steviol – The substance in Stevia that people worry about- was WAY too high. They gave the rats an amount of concentrated Steviol equal to if a human ate half of his weight in Stevia leafs every day. With that much of a chemical, even sugar would be dangerous! If you calculate the daily consumption of Stevia to replace the average daily sugar consumption, a human would eat 4 gram of Stevia leafs – Not nearly half the weight of a human body. Stevia has been a healing plant and a sweetener for the Indigo people for hundreds of years and has been used in Japan and Brazil to sweeten lolly pop candies, coke drinks and many other foods for about 30 years so far. The USA allows “Reb A” (a sweetener made of stevia) since 2008 as food additive. So after all these studies, no REAL negative Stevia side effects have been seen yet. This is an additional sign that there are just no bad effects from Stevia on humans. Of course, optimally there would be more studies in progress, but the problem is, as always, the money. Who’s going to pay for these experiments? The sugar industry, which could be a possible sponsor, is afraid of Stevia killing their business, so of course they’re not funding it. Maybe if they could see the potential of the ‘sweet leaf’ (the nickname Stevia has earned for itself), someone would take action. Additionally the World Health Organistation (WHO) published a report in 2006 which says: ”Stevioside and Rebaudioside A are not genotoxic in vitro or in vivo and that the genotoxicity of Steviol and some of its oxidative derivatives in vitro is not expressed in vivo.” In 2008 the Food and Drug Administration of the USA (FDA) classified Truvia (by Coca-Cola) and PureVia (by PepsiCO) – both substances based on Stevia – to GRAS, Generally Recognized as Safe. Update: The European Food Safety Authority (EFSA) sent a report about the at least healthy daily dose of steviol glycosides to the European Comission in April 2010. So we can expect a decision about the approval of stevia as a food additive soon. Stevia has been recognized for hundreds of years by tribes in South America. In this time it has not only been used as sweetener but as a healing plant and healthy food additive as well. Unlike artificial sweeteners like aspartame, Stevia is said to have no bad effects on the insulin balancing process of the human body. Instead, as the report of the WHO mentioned above says it has a negligible effect on blood glucose and could even enhance glucose tolerance. That makes it not only a good natural sweetener for diabetics, but for everyone who wants a healthy blood sugar. Sugar is well known to be extremely calorie intensive, however, Stevia contains no calories. Yet Stevia is still 300 times sweeter AND it’s good for your teeth and – Stevia is effective against cavities and dental plaque. Other experiments and researches found some positive Stevia side effects on obesity and high blood pressure. All this makes the ‘sweet leaf’ a natural and healthy alternative to sugar and synthetically produced sweeteners. You can use it for cooking and baking as it’s highly heat-resistant and perfectly water soluble, making it a perfect sugar substitute.